Registering to vote allows individuals to participate in elections and provides the opportunity to help decide who will serve in elected office. 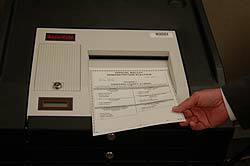 Individuals can register to vote in person at the County Clerk’s office, located at 189 E. Court St., Kankakee, or by mail. Members of the armed services discharged within 60 days prior to said election. Members, spouses, and dependents of the Merchant Marine.